Unigrit technology leaves a smooth finish that buffs out quickly! Meguiars Unigrit Sand Papers remove deep scratches and orange peel and leave a smooth, even finish that buffs out easily. The tiny abrasives level the paint without the risk of deep sanding scratches. Meguiars Unigrit Sand Papers are waterproof, durable, and clear coat safe. 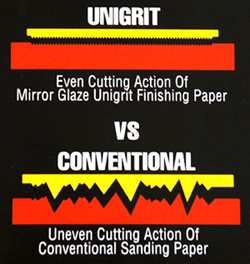 For automotive wet-sanding, Meguiars Unigrit Sand Papers are the professional’s choice. The risk of wet-sanding your car with typical sand paper is that they can cut the paint too deeply. Deep scratches take longer to buff out and can leave the paint looking uneven. Meguiars Unigrit Sand Papers have uniform, small abrasives that leave an even pattern on the paint. No deep scratches. The finish buffs out quickly and easily, leaving the paint glossy and smooth. Meguiars Unigrit Sand Papers save you time and effort. Meguiars Unigrit Sand Papers are made to last longer and work better than other sand papers. Meguiars specializes in detailing products for the car care professional. Meguiars Unigrit Sand Papers are economical and long-lasting. They do not load up as quickly as other sand papers, so you can work longer. What can Meguiars Unigrit Sand Papers remove? Wet sanding is done to remove paint imperfections like orange peel. Orange peel is a very common condition where the paint did not lay out perfectly smooth when it was applied. The paint literally looks like an orange peel. Because light is bouncing off these tiny bumps, the finish is not as glossy as it could be. Wet sanding orange peel is the only way to achieve a perfectly smooth gloss! Meguiars Unigrit Sand Papers are excellent at removing orange peel because Unigrit technology ensures that you’ll get uniform results. Orange peel affects the whole vehicle and you want the finish to be flawless from any angle. When wet sanding clear coat in particular, you’ll be able to see differences in the paint’s shine if it’s uneven. Meguiars Unigrit Sand Papers will help you achieve a uniform gloss on the entire vehicle. You will also need a Meguiars Sanding Pad. Wrap the sand paper around the sanding pad to provide an even surface against the paint. (If you use your fingers, you’re likely to apply more pressure with your index and middle fingers, resulting in uneven results.) The Meguiars Sanding Pad distributes the pressure of your hand over the 5 3/8 inch pad. The sanding pad is soft and flexible to conform to the shape of your vehicle. Meguiars Unigrit Sand Papers are available in 6 varieties from 1000 to 3000 grit. By finishing with a 2000 – 3000 grit paper, less buffing will be needed to get a flawless finish.